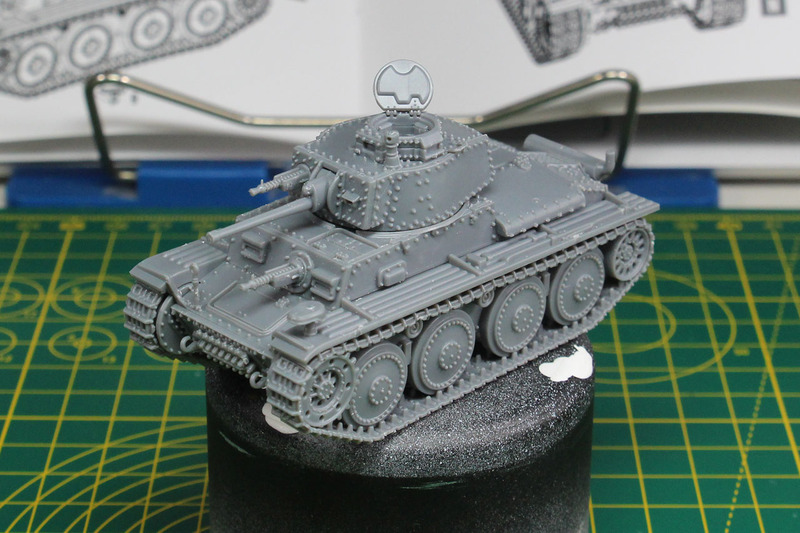 Let us begin this themed week of reviews around the Panzer 38(t) with the tank itself, in this case the new plastic kit by Warlord Games. The Panzer 38(t), registered as Sd.Kfz. 140 in Germany, was originally a pre-world war II pattern from Czechoslovakia named LT vz. 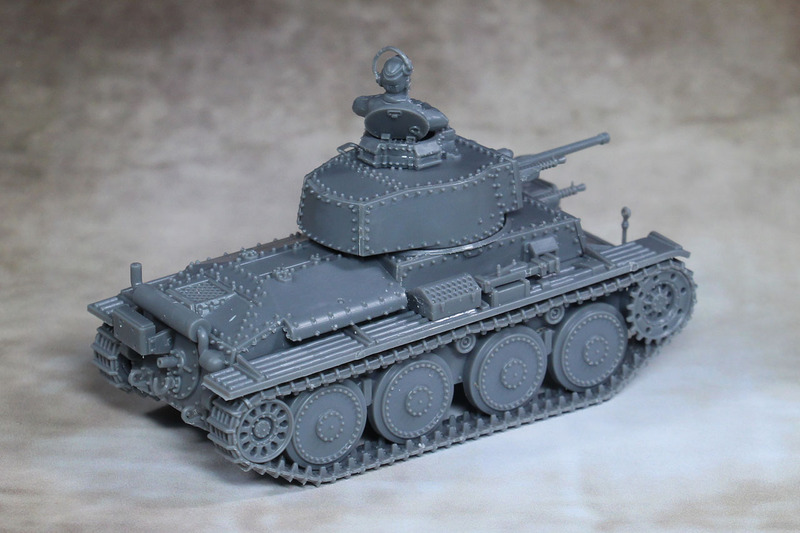 38 (Lehký tank vzor 38, Light Tank model 38). After the Third Reich took over Czechoslovakia, the tank was adopted into german service and formed the basis for many variants. Many of those variants will be covered here on the blog in the next days. 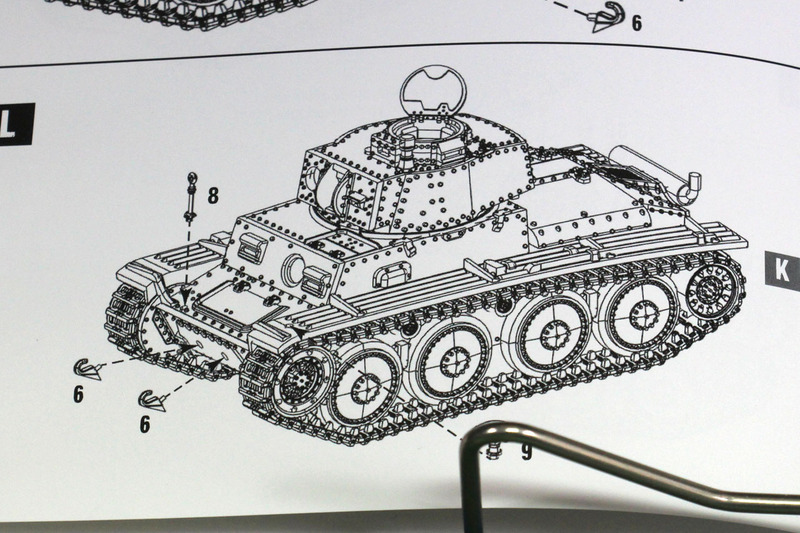 The base variant, the Panzer 38(t), is simply called tank 38, with the t standing for tschechisch, the German word for Czech. This nomination goes with all the captured vehicles, like Shermans as Panzerkampfwagen M4 748(a) - a for amerikanisch (American) - or KV-1s as KV-1 756(r) - r for russisch (Russian) - used in German service. 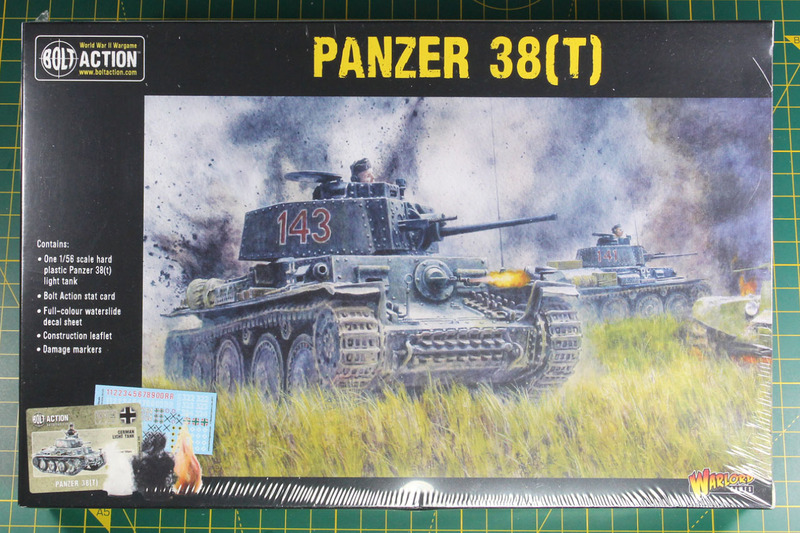 The Panzer 38(t) was used in the invasions of Poland, France and the USSR, but production ended in 1942, as the pattern couldn't compete with the ongoing development of tanks. 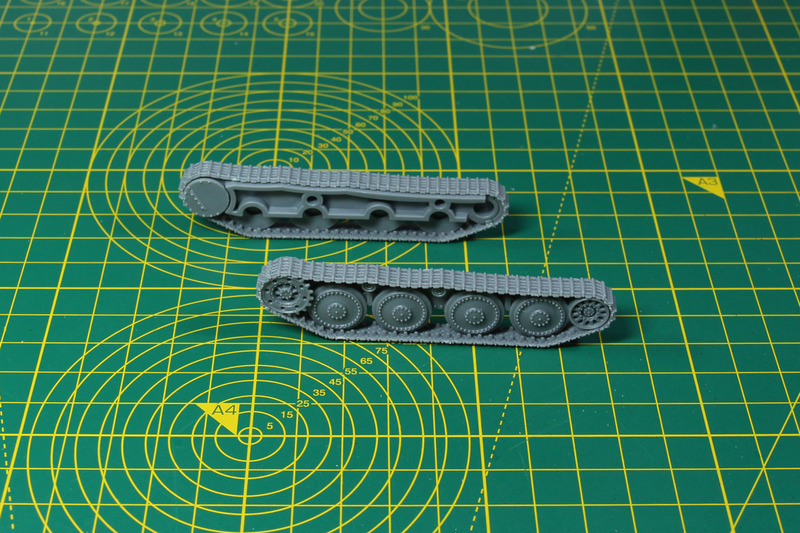 The chassis was still used for variants and some of the components for derivate vehicles until the end of the war in 1945. 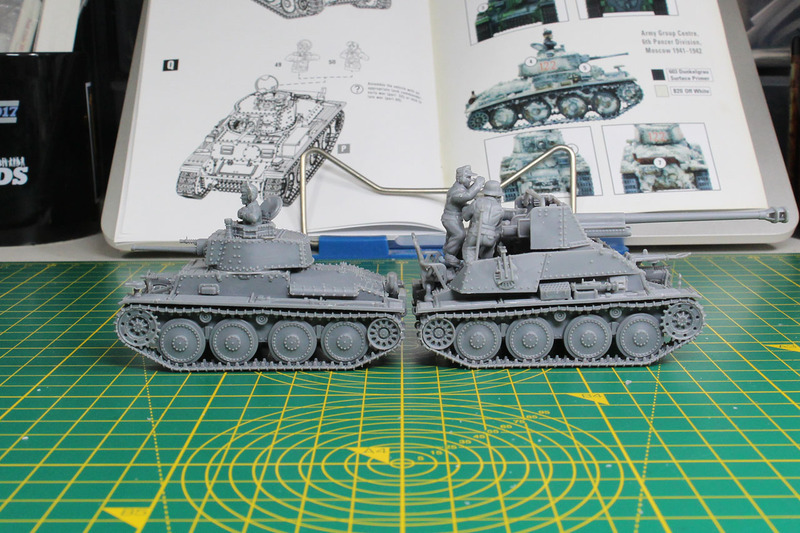 The total number of produced Panzer 38(t) for the German army was more than 1,400 units. 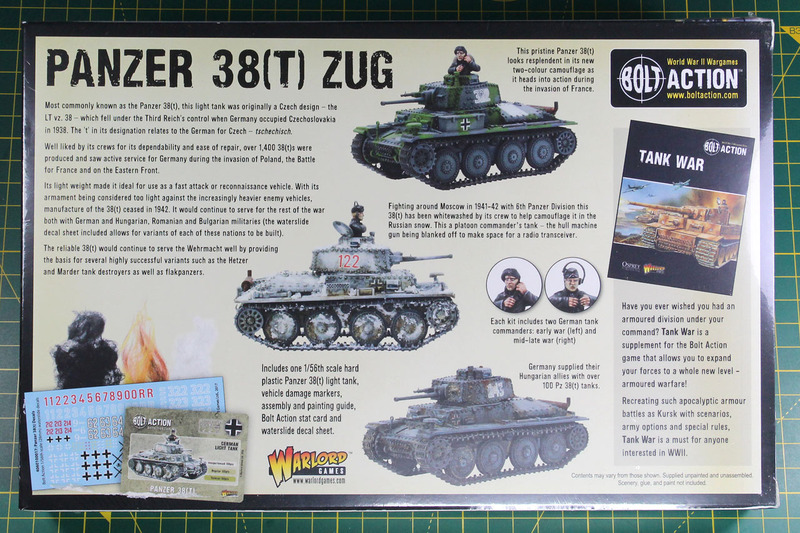 But the Panzer 38(t) saw service not only within the German Army but in the military forces of Hungary, Slovakia, Romania and Bulgaria as well. And that was not the end of the Panzer 38(t), as it was exported and build under license until the 1960s by Switzerland and Sweden. Syria even used some units in the Third Arab–Israeli War. 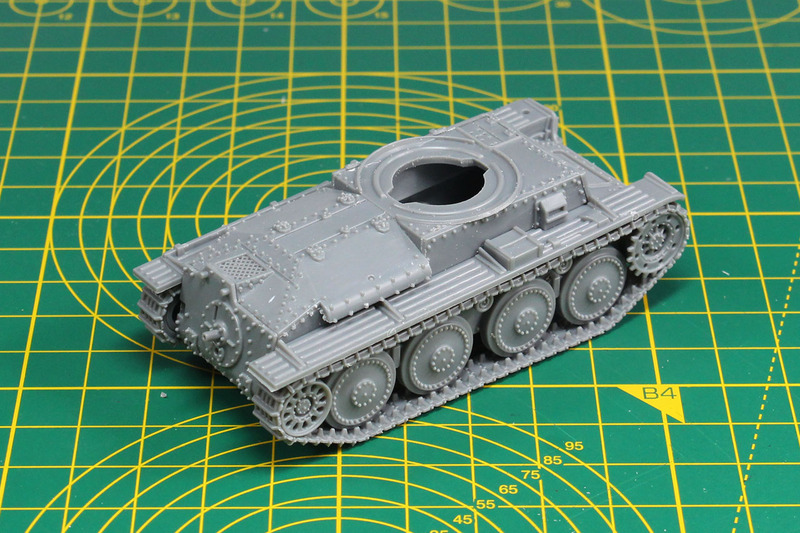 Warlord Games covers the tank Sd.Kfz. 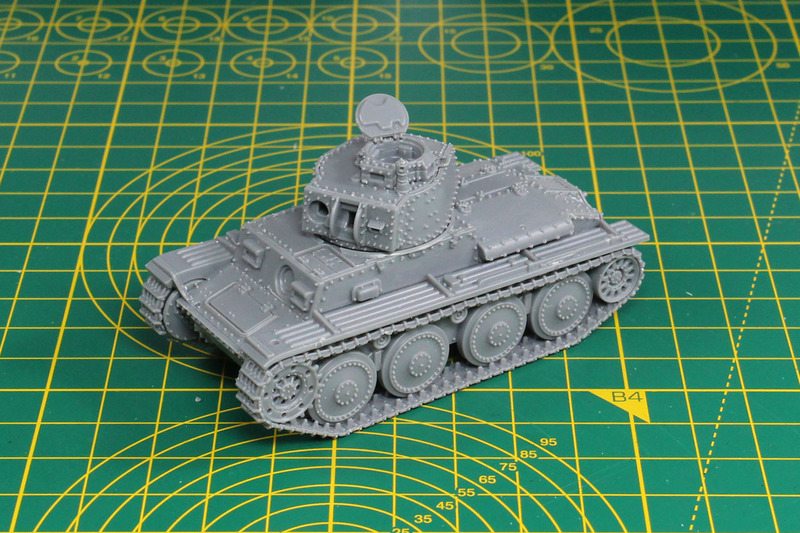 140 as a hard plastic kit in 28mm / 1:56 scale, that is produced in-house by Warlord themself. The kit is offered at a price of 18 GBP. Warlord offers a platoon of 3 for 50 GBP. 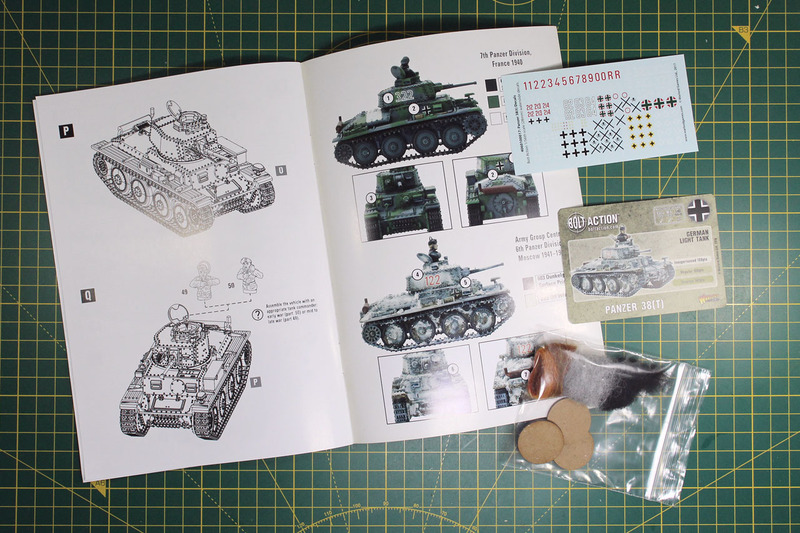 The kit consists of two hard plastic sprues, a multipage instruction leaflet with a bit of background in it, a decal sheet, stat cards and damage tokens. The decal sheet covers beside the insignia of the German tank forces for the Hungarian, Romanian and Bulgarian forces as well. The casting is properly done and crisp. 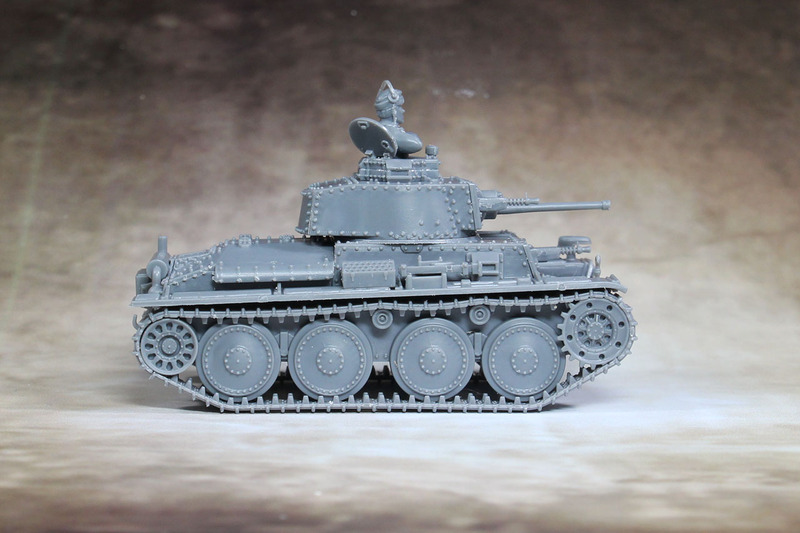 This kit is not a cooperation with Italeri and therefore has the classic hard plastic sprues, we know from the Infantry range, and I assume that those are produced at the same place Plastic Soldier Company does. 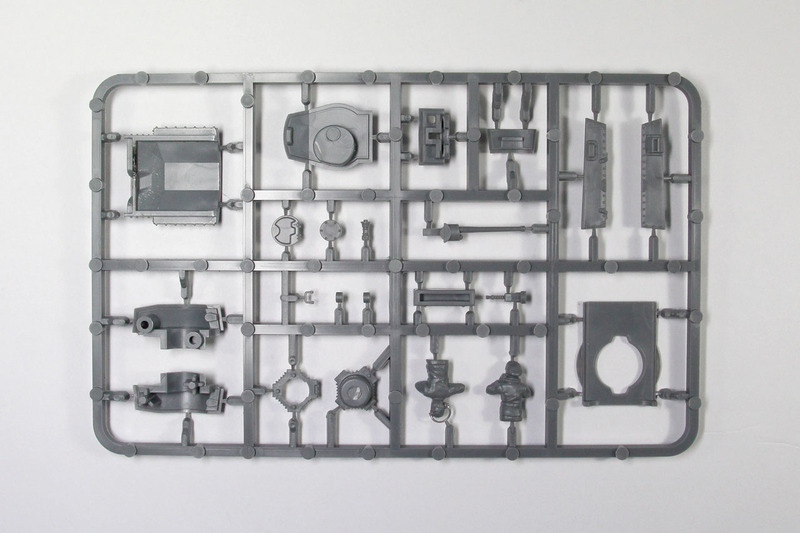 The space within the sprue is cleverly used and the amount of parts is wargamer friendly. 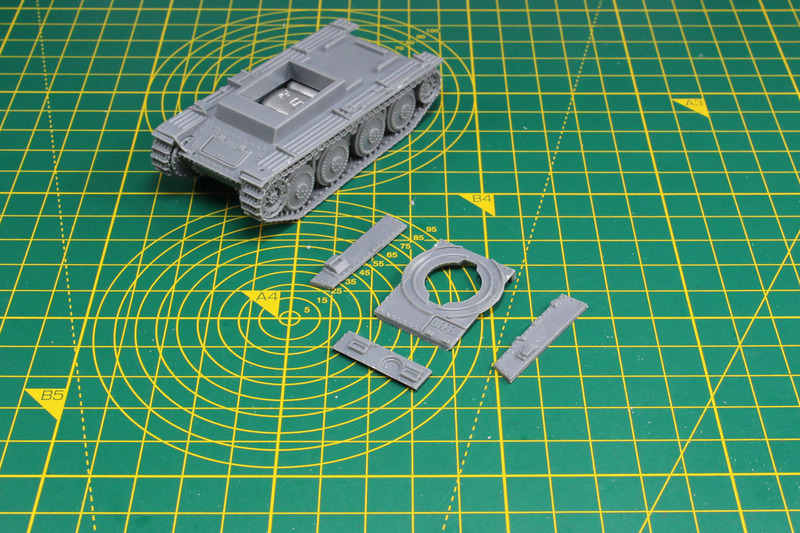 Only drawback, the part numbers used in the instruction are not on the sprue itself but on an overview page within the instruction leaflet. That is a bit annoying as you have to turn the pages back and forth during the assembly. Assembly starts with the track section. Pretty straight forward built with nice details and not too many pieces. Casting on the tracks is great as well. 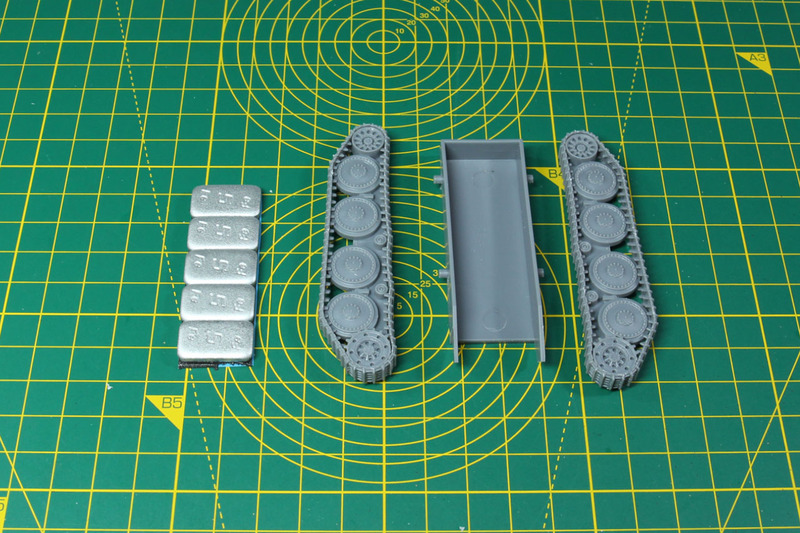 The tracks are glued to the sides of the lower hull. 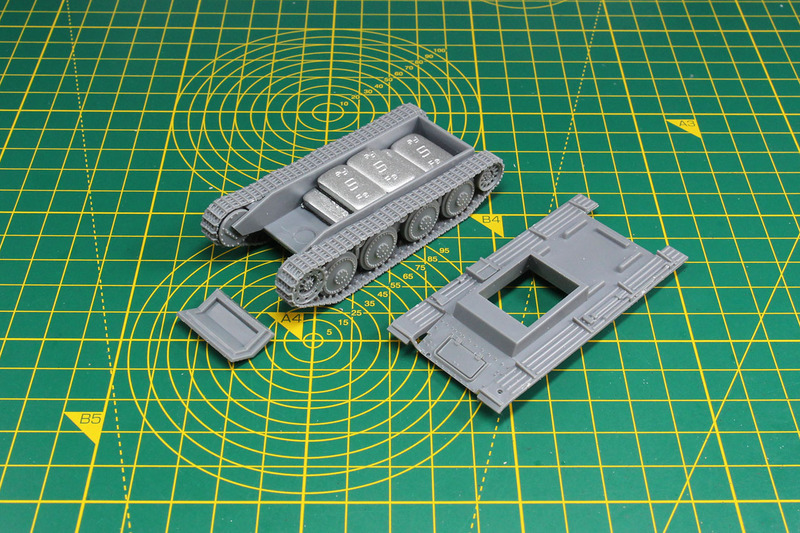 As this is a plastic kit, I usually add a bit of lead to the hull to weigh it down. As the hull is prepared, the lower front plate and the upper hull are added. Next the drivers compartment and the top plate is added to close the hull, along with the back engine cover and the back plate. Majority of the build is already completed after these few steps, as the hull is done and only a few detail pieces have still to be added. 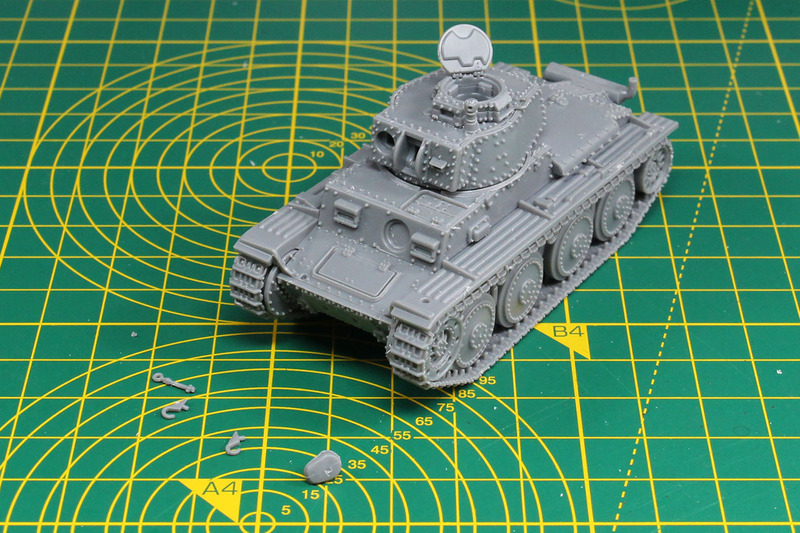 The turret is another simply component of this build and is turnable on the hull. 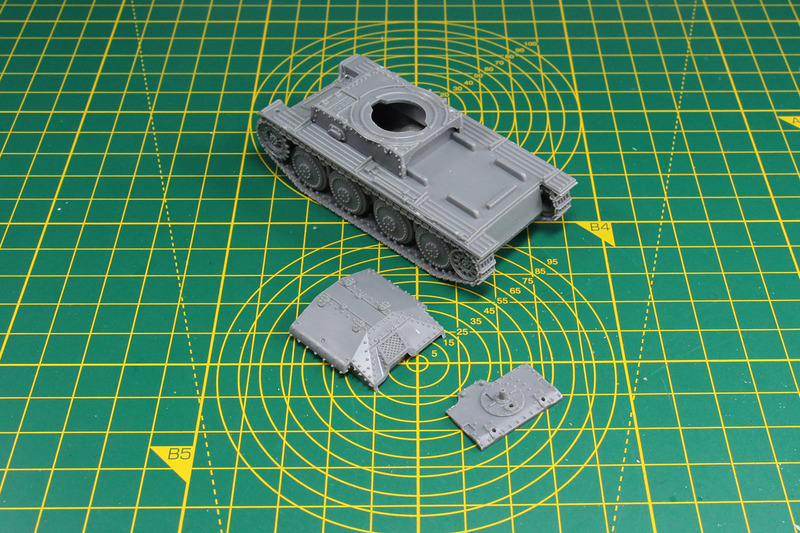 The commander's hatch can be build closed or open, and there are two tank commanders in this kit included. 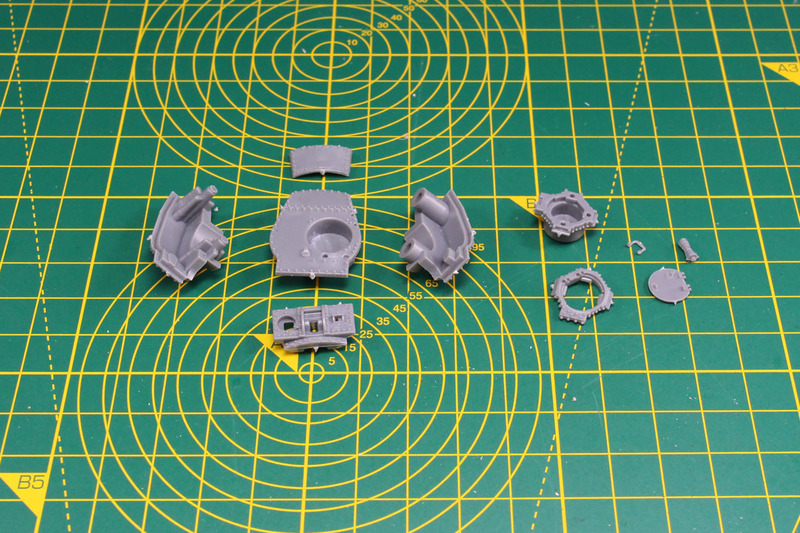 After the exhaust is added, there is one of the first optional parts that can be added to the kit. A tool compartment that wasn't used with the Ausf. 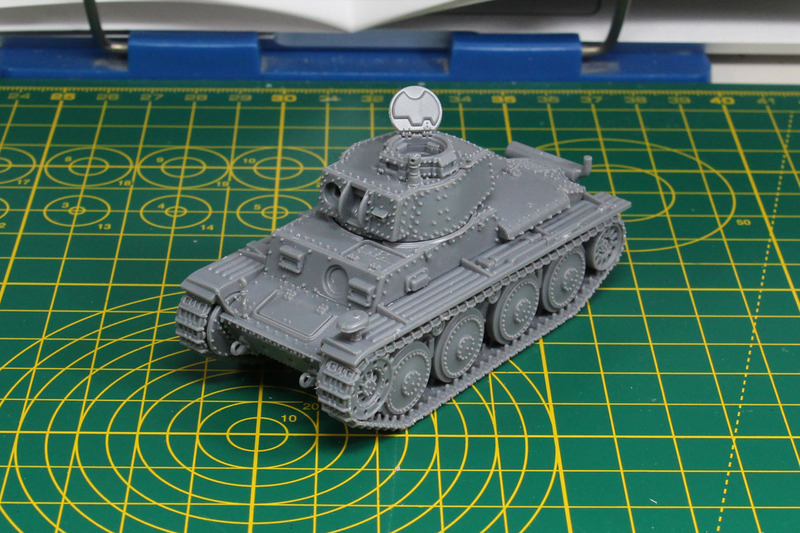 B of the Panzer 38(t). Please pay attention to this step, as the instructions tell you falsely to glue the hooks to the inner slots (see image in the middle). These are for the spare tracks, not for the hooks. The hooks need to be glued to the outer holes. 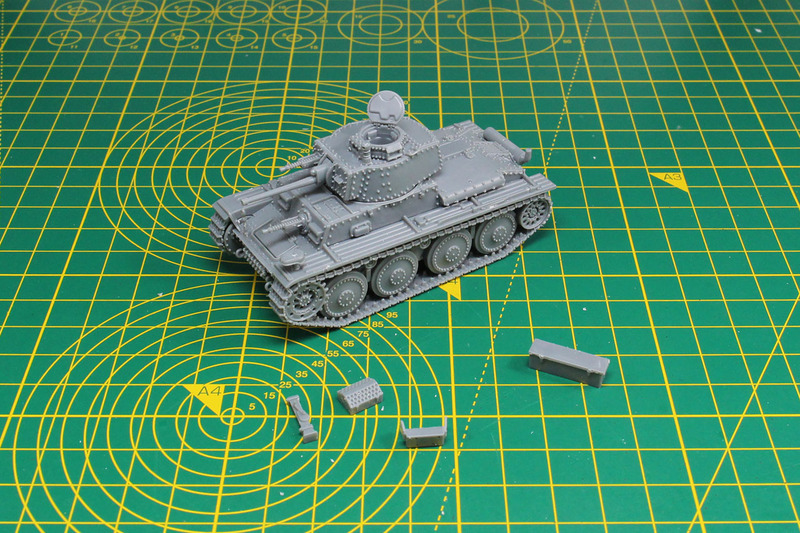 In this step the front-facing MMG is added to the hull. 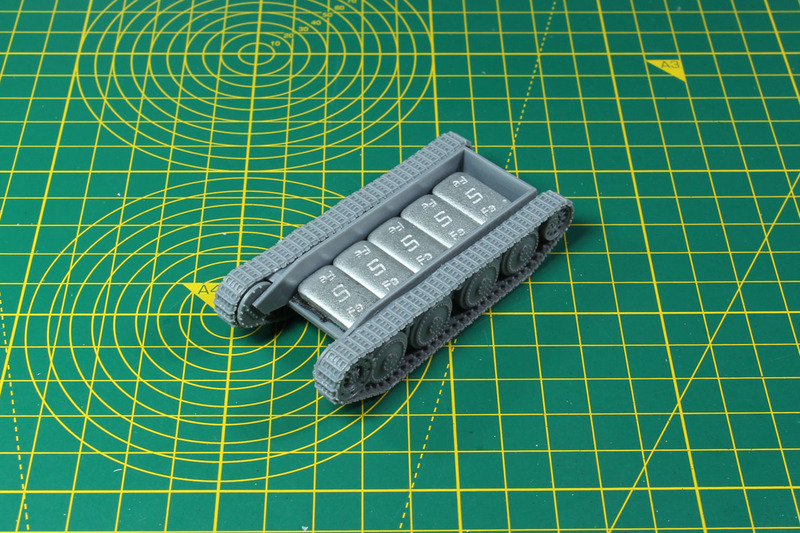 If you're building a platoon for an early war tank list, you could replace the mmg with an empty armour plate that covers the extra radio transceiver. 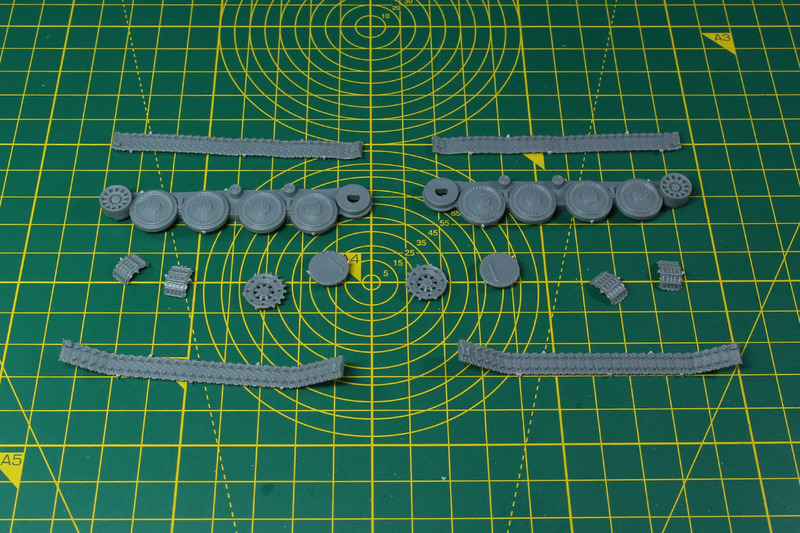 Further optional parts can be added in Step O of the assembly instruction, depending if you want to field it as Ausf. E/F/G or B/C. 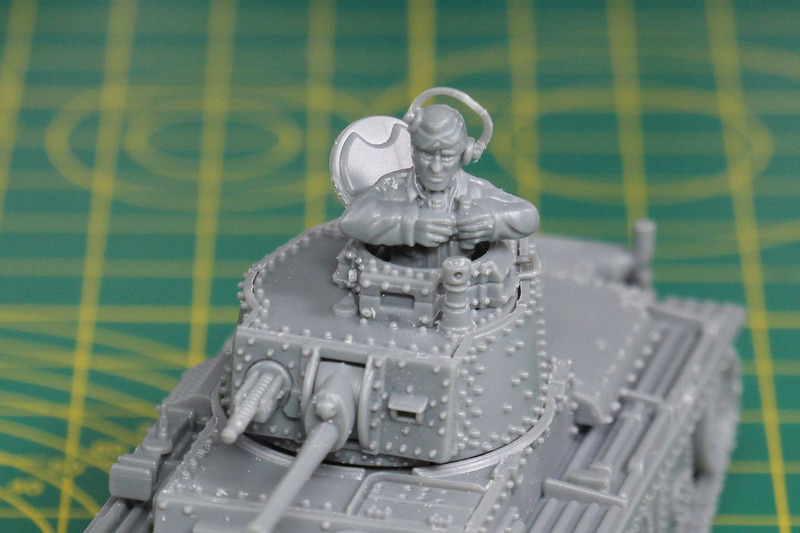 Next up the two different tank commander miniatures, for early and late war. 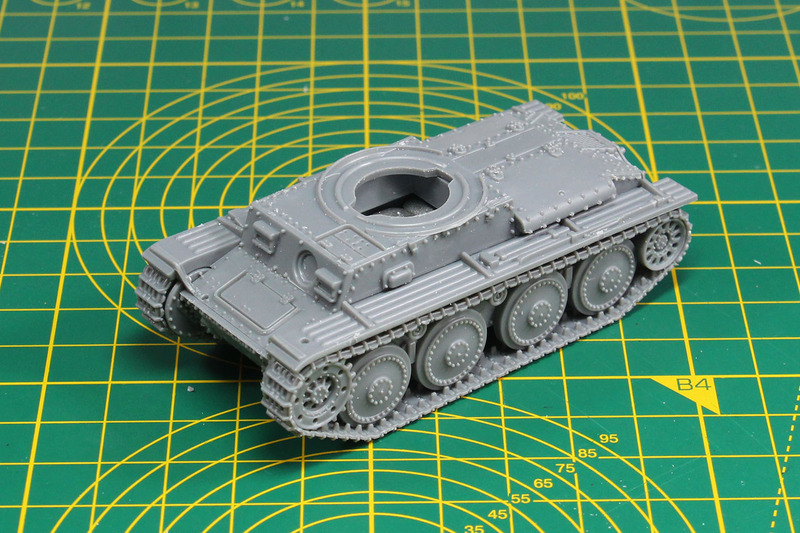 The Panzer 38(t) shares the chassis with the Marder III Ausf. 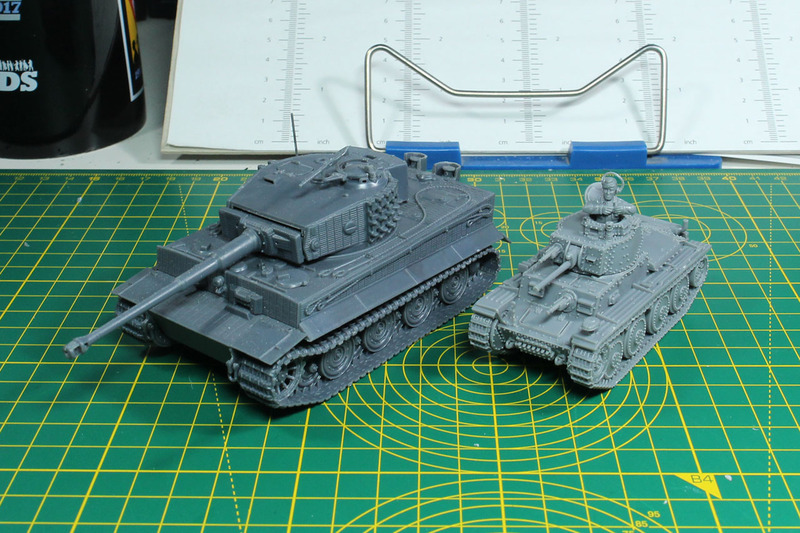 H and both are available as kits by Warlord. See the side by side comparison and you see the clear relatedness. 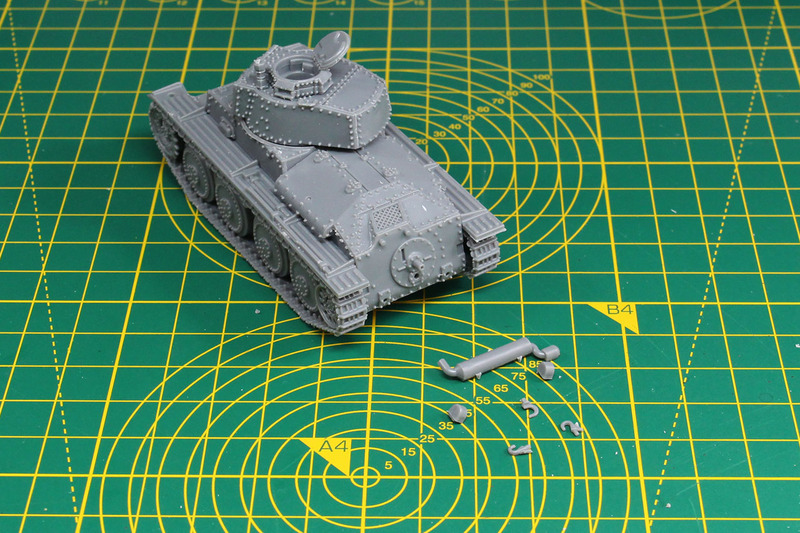 And see the size difference between one of the "larger" tanks of the early are and the later, heavy battle tank Tiger. And the last set of pictures, a views shots from around the tank. 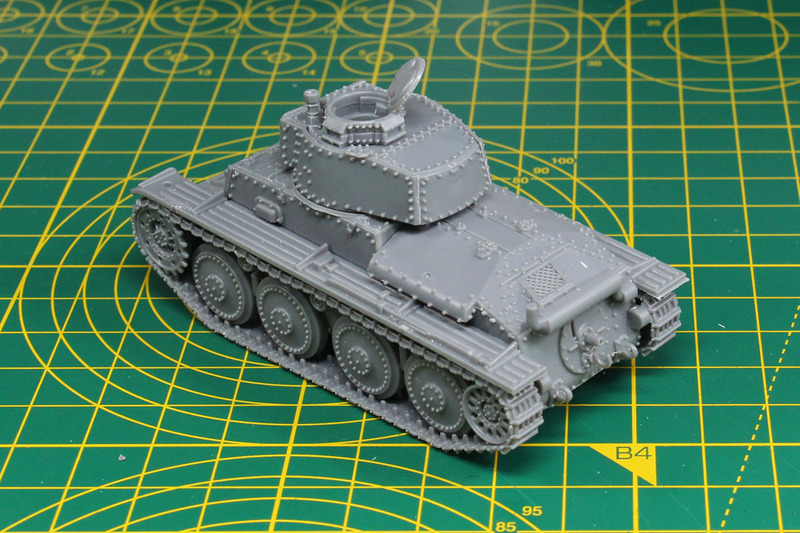 The Panzer 38(t) is a greatly done kit. It was very much fun to build and went easy on the table. The casting is crisp and the fit is pleasant. 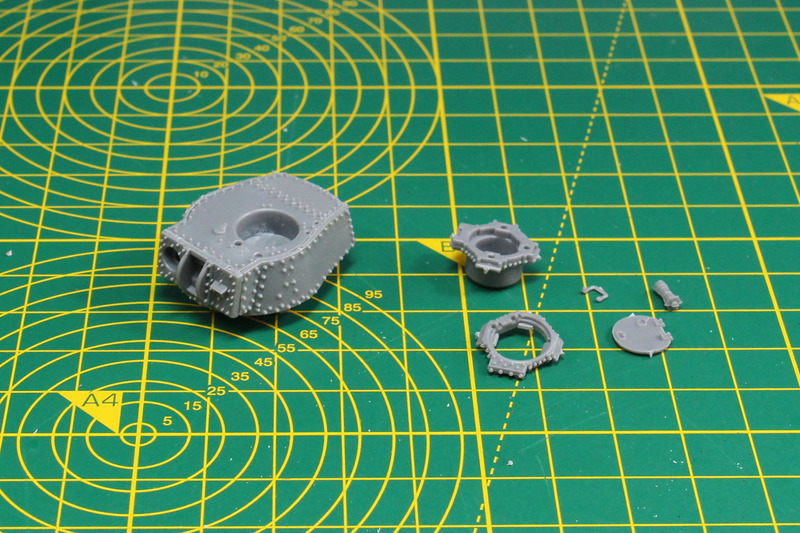 There are a few optional parts with it, so you can vary it a bit. 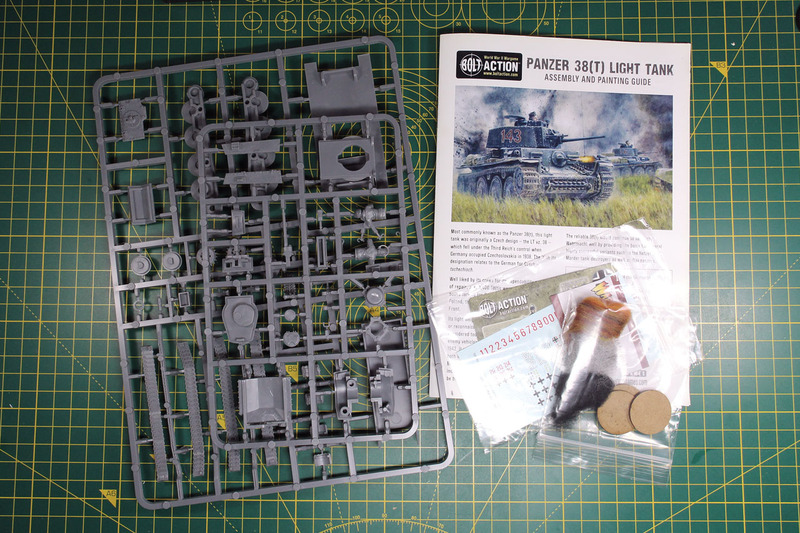 You can see that this kit was planned with the gamer in mind, as it has a reasonable number of pieces, but still great detail, and is assembled rather fast. The price tag of 18 GBP is absolutely fair for this kit. 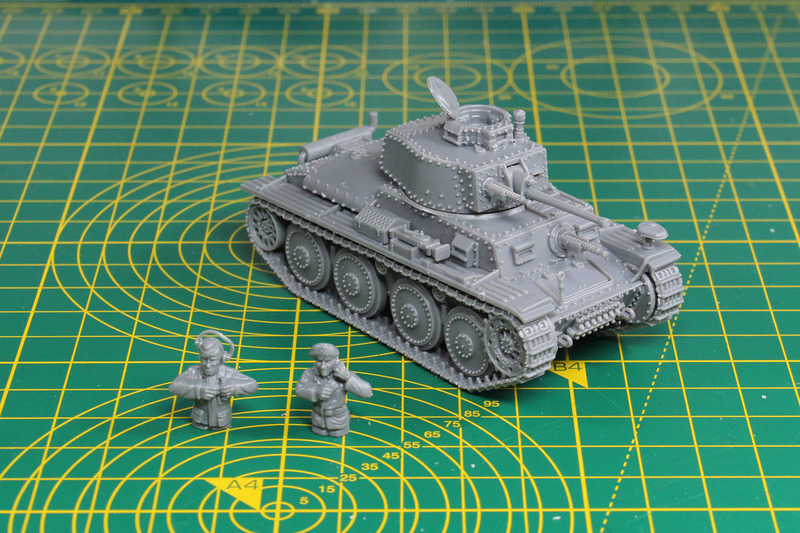 If you play one of the smaller Axis forces, like Hungary or Romania (their rules are covered in Italy and the Axis), or look for matching armoured vehicles for early war lists, you should really keep an eye on this kit. If you're planning to build a Swedish army (there are no official rules, as Sweden stayed neutral during world war 2, but why not use a mixture of early war German and Finnish units? 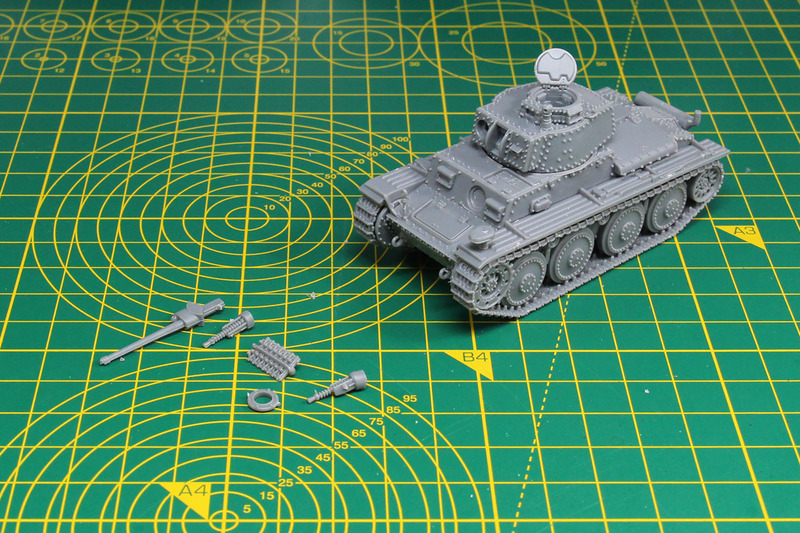 ), you could use this kit to build some Stridsvagn M/41, a license-built version of the Czechoslovak TNH tank (the Panzer 38(t) we're seeing here). Based upon the chassis Sweden build in the after-WW2 era the Pansarbandvagn 301 (Pbv 301), a mechanised infantry combat vehicle / armoured personnel carrier. To achieve that, you'd need a bit of plastic card and some bits in addition to this kit. As mentioned above, this tank was used after the Second World War by the Swedes and Swiss, as well as in Syria. 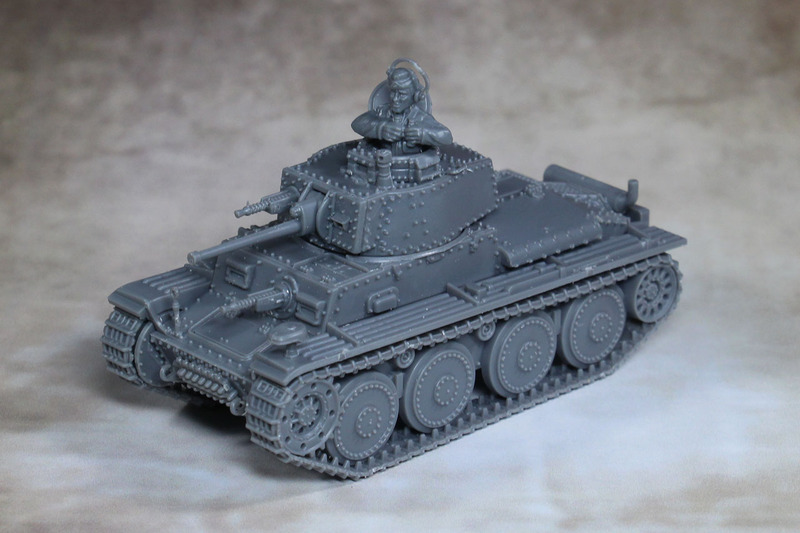 So if you're playing Team Yankee or some other Cold War gone hot setting in 28mm, this is an interesting kit for you. 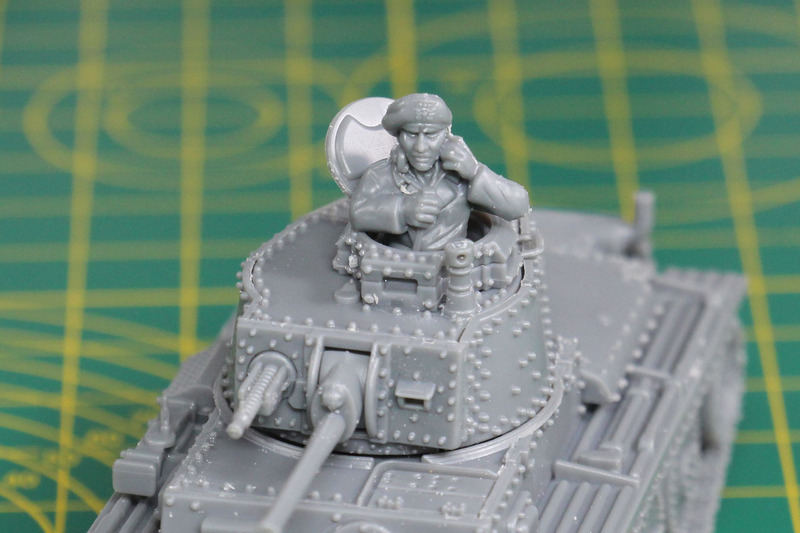 And if you're thinking that those what-if and paper panzers are only part of the late war years, there is a lot of potential for conversions based upon this kit. 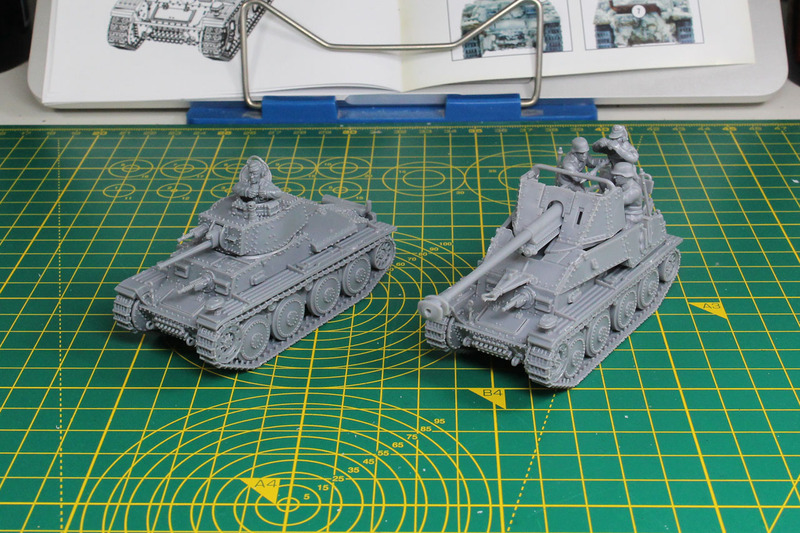 You could build a Flakpanzer 38(t), Munitionspanzer 38(t) or Bergepanzer 38(t) (not to be confused with the Hetzer variant).